PLEASE NOTE: A typical itinerary to the Antarctic Peninsula is illustrated below. All itineraries are for guidance only. Programs may vary depending on local ice and weather conditions, the availability of landing sites and opportunities to see wildlife. The final itinerary will be determined by the Expedition Leader on board. Flexibility is paramount for expedition cruises. Average cruising speed for m/v Ortelius is 10,5 knots. Your voyage begins where the world drops off: Ushuaia, Argentina, said to be the southernmost city on the planet, located on the southernmost tip of South America. Starting in the afternoon, you embark from this small resort town – appropriately nicknamed “The End of the World” – and sail the scenic, mountain-fringed Beagle Channel for the rest of the evening. 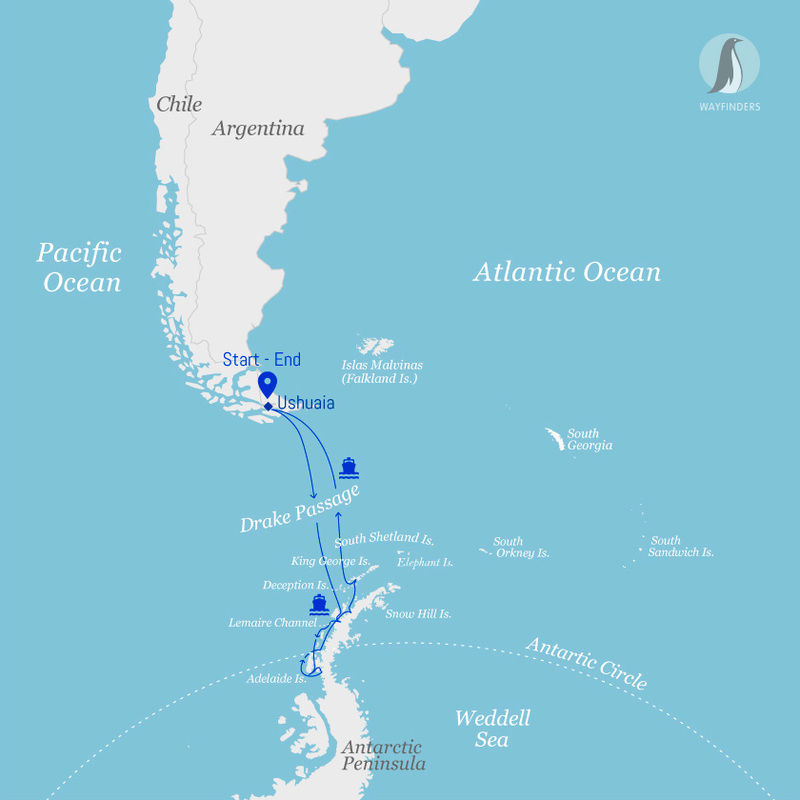 Over the next two days on the Drake Passage, you catch a taste of life from the point of view of the polar explorers who first braved these regions: cool salt breezes, rolling seas, maybe even a fin whale lunge feeding in the water below. After passing the Antarctic Convergence – Antarctica’s natural boundary, formed when north-flowing cold waters collide with warmer subantarctic seas – you are in the circum-Antarctic upwelling zone. 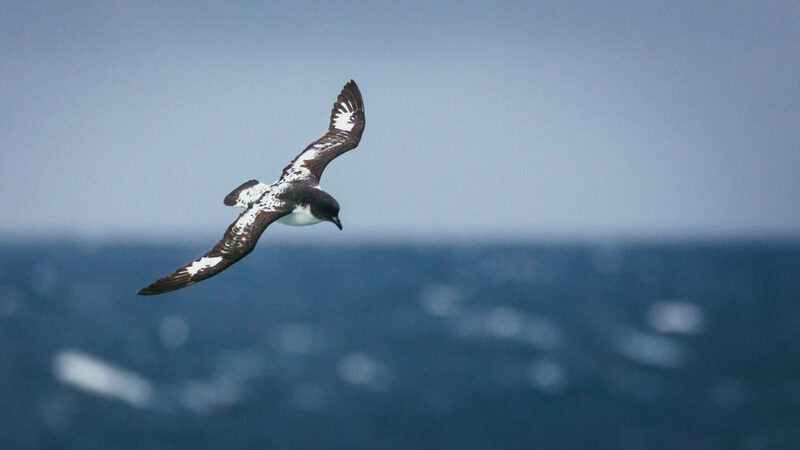 Not only does the marine life change, the avian life changes too: A variety of albatrosses and petrels show up, along with Cape pigeons and southern fulmars. Then, near the South Shetland Islands, the first icebergs flash into sight. Marvel at gray peaks sketched with snow, towers of broken blue-white ice, and the dramatically changing wildlife below and above. You first pass the snowcapped Melchior Islands and Schollaert Channel, sailing between Brabant and Anvers Islands. Then on to Cuverville Island, stabbing up between Rongé Island and the Antarctic Peninsula. On Cuverville lives a massive colony of gentoo penguins as well as pairs of breeding brown skuas. Neko Harbour, the next stop, affords you the first chance to step onto the Antarctic Continent itself – an epic landscape of mammoth glaciers and endless wind-carved snow. During the next stop at Paradise Bay, you may be able to take a Zodiac cruise in its sprawling, ice-flecked water before sailing on to Lemaire Channel. After a comfortable night spent sailing – or for you, sleeping – you wake among the many islands south of Lemaire Channel. You are now near the Antarctic Circle. At this point a voyage through the aptly named Gullet – a narrow but picturesque channel between Adelaide Island and the Continent – is possible if the ice isn’t too thick. You can explore this area either from the bow of the ship or the edge of a Zodiac, getting the closest possible contact with the terrain as you venture southward. You might also circumnavigate Pourquoi Pas Island, named after the ship of the famous French explorer Jean-Baptiste Charcot. This location is known for its tight fjords and lofty, glacier-crowded mountains. On Horseshoe Island is the former British Base Y, a remnant of the 1950s that is now unmanned, though still equipped with almost all the technology it had while in service. Stonington Island is home to the former US East Base and British Base E, which was occupied until 1975. If a stop here is possible, it will mark the southernmost landing site of the trip – at 68° south. From there your road turns north again, through the Gunnel Channel into Hanusse Bay, with its countless icebergs – and a good chance of spotting whales. The first day finds you near the Antarctic Circle again, cutting north through the countless ice floes of Crystal Sound. Humpback whale sightings are likely here, and your approach to the Fish Islands offers the possibility of a Zodiac cruise or even a landing. Whatever the case, the scenery is beyond compare in this area, and there may also be more Adélie penguins congregating among the icebergs nearby. If you’re a bird lover, Petermann and Pléneau Islands provide a great variety of avian life – as well as Zodiac cruises among icebergs that are popular leopard seal and crabeater seal hangouts. Minke whales, humpbacks, and gentoo penguins also love to frequent this “hot spot” of Antarctic activity. If the weather is fair, you might even get a closer look at the whales on the Zodiacs. Later you reach Foyn Harbour, where the rusted wreck of Guvernøren – a whaling factory vessel that caught fire in 1915 – tells tales of a former age of industry. If you are a certified scuba diver, this is one of the possible locations for a dive on this trip. The last day calls for a truly unique sendoff. Yours will be a potential landing at Hannah Point on Livingston Island. There you may see gentoo and chinstrap penguins, southern giant petrels, and elephant seals hauling out onto the beach. A humpback whale may also shrug out of the surrounding sea, and Antarctic fur seals are known to show their faces later in the season too. Your precise time of departure will depend upon the weather. Every adventure, no matter how grand, must eventually come to an end. On the morning of your fifteenth day, it’s time to disembark in Ushuaia – but with memories that will accompany you wherever your next adventure lies. If the Gullet is blocked by ice, you may take a course around the western side of Adelaide Island to reach Marguerite Bay. Should ice conditions also not allow this approach, you may continue the program by exploring the Antarctic Peninsula in (and around) the Penola and Gerlache Strait.